The gastronomical hotspot in Abu Dhabi, Urban RetrEAT, introduces an exciting offer from all your favorite vendors this Holy month of Ramadan. 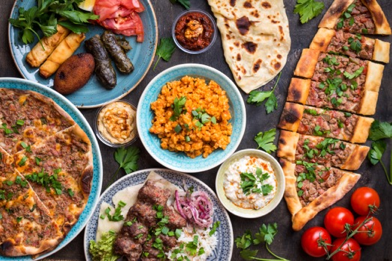 A time shared with family and friends to break their fast together, all vendors at Urban RetrEAT will be offering a set menu ranging from 50AED to 120AED that includes soup, salad, a selection of mains, desserts and much more to indulge in. Urban RetrEAT has become one of the most-talked about food venues in Abu Dhabi since its launch in June 2018. Founded by Dana Al Sharif, it is set to become the largest platform to support home-grown talent in expanding their businesses, creating and setting trends in the Middle East’s food scene. This Ramadan, the food incubator will be opened from 1pm to 1am on weekdays and 1pm to 2am on weekends. Live performances from Arabic local artists will be on show on weekends for all food lovers to enjoy while they break fast throughout Ramadan. · Flipt Kitchen: contemporary French cuisine, this will be Flipt Kitchen’s debut to market.